Okay, it’s a click-bait sort of title. You’re not going to gain any profit, save learning about your winter birds, by watching birds in your own back (or front!) yard, but you can aid ongoing research about North American birds by participating in Cornell Lab of Ornithology’s and Bird Studies Canada’s Project FeederWatch. Besides, bird watching is fun and interesting, especially for bird geeks! Who wouldn’t swoon at viewing this handsome chap? Blue Jay (Cyanocitta cristata) bathing. Check out the droplets of water on his feathers. 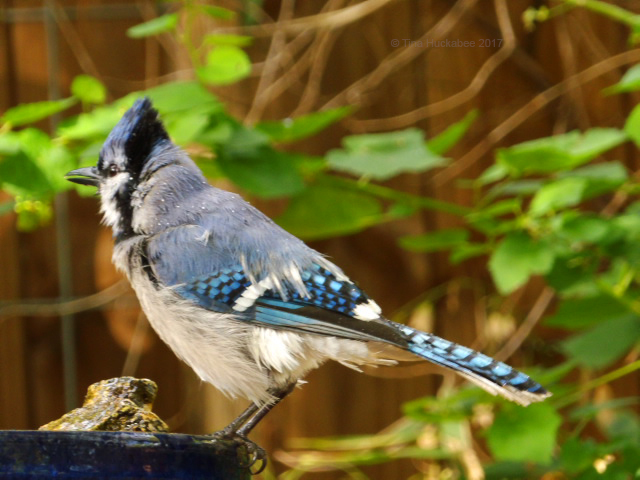 A year-round resident of Central Texas, Blue Jays are stunningly beautiful, charming–and noisy! Project Feederwatch enlists citizen scientists (a highfalutin, fancy-pants term for volunteer) to regularly watch birds from specific spots–back yards, front yards, community gardens–from November to April, and then report numbers and varieties of birds who show up due to something placed to attract those birds. Appropriate bird paraphernalia includes feeders (duh…), water features, houses and the like. There are specific counting measures (easy to understand and follow) and the method for uploading to Cornell’s site is easy-peasy. The weekly time commitment is whatever you want it to be (15 minutes or hours-long), and with specific parameters–also doable. Shy and wary, this Red-bellied Woodpecker (Melanerpes carolinus), is another year-round resident, but I only see them in my garden during winter and early spring. He and his mate are mad for suet! And gosh darn it–birds are beautiful and vital for our gardens and the ecosystem as a whole. Why wouldn’t you want to learn more about their habits if what you learn potentially helps them survive and thrive? My winter birds are showing up and showing off! 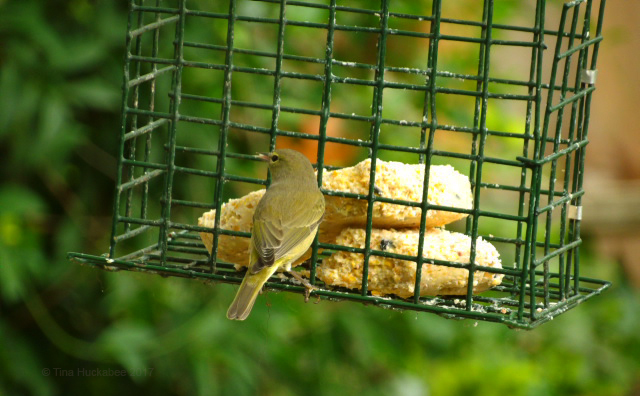 An Orange-crowned Warbler (Oreothlypis celata) waits his turn at the suet feeder. He, his mate and other warblers will likely be present in my garden until April–then head north for breeding. To participate, check out Project FeederWatch. There’s a required small fee ($18) US, ($35) CAN, which covers various administrative costs. Officially, Project FeederWatch started this past week, but jump in whenever you have the time and inclination–bird lovers everywhere will cheer and the fine folks at Cornell Lab of Ornithology and Bird Studies Canada will appreciate and utilize your efforts and data. Additionally, if you love wild birds and regularly feed them, this timely Cornell’s All About Birds article is a reminder about the various types of feed appropriate for birds and is a good read, whether or not you participate in Project FeederWatch. It’s an excellent reminder that our choices of bird feed should be about their needs and not just what we think they should have. Orange-crowned Warbler enjoying some fat-filled suet. 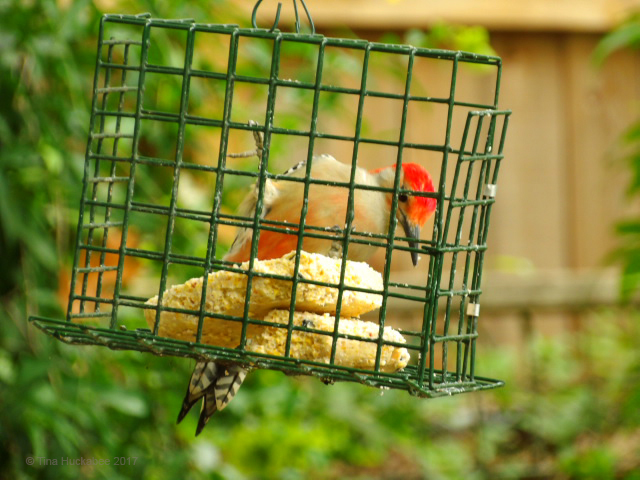 This entry was posted in Bird Studies Canada, Cornell Lab of Ornithology, Project FeederWatch, Uncategorized and tagged Back yard birding, Bird feed by Tina. Bookmark the permalink. Do they taste like chicken? Although I am not into bird watching, there are a few birds that get watched around here. I do not know what is so special about them, except that there are only a few of them around. One is the great blue heron who eats small frogs in the fields when the rain starts. The other is the lesser green heron, who is not much to look at, but lives in trees over parking lots. I don’t know why they like parking lots, but that is where they always seem to nest. There are only a few around, so bird enthusiasts really tune into them. Haha–I think you’ll need to ask the local raptors that question, though mostly, they go for the White-winged doves, which is just fine with me. Interesting that you don’t have many birds, though I suspect there are more than you think. I never realized just how many warblers and other songbirds were in my midst, until I began to really look–and there they are! Now that you mention it, I do notice the quail; but they are so cool that I do not eat them. Besides, they are fast. The turkey are annoying. They used to dig in my garden. They DO taste more like chicken than turkey, which is good, since I do not like turkey much. I will probably like it day after tomorrow, though. I’ve participated in Project Feeder Watch a few times, then neglected to do so last year. Thanks for the reminder to take part again this time around. I remember you had a post about the one day bird count that Cornell (and I think, Audabon) sponsors in February and as I recall, you had quite a show. This would be wonderful fun, if only I had a backyard and some feeders! While it would be possible theoretically to hang feeders at my apartment, which I’ve done in the past, the arrival of the pigeons and the complaints of downstairs neighbors make it less than desirable. But I’ll be glad to hear about your results — it’s a great project. You can watch at community garden spots, as well, though I think they’re wanting sites that are purposely attracting birds, so feeders, water features would be required. I really enjoyed this little bit of work last year and through the committment of watching each week, realized the variety of birds that visit my garden. It was a learning experience for me. I’m sure a couple of the birding centers are participating, since they do have water features, and so on. It’s no doubt going to be a part of events at the various Audubon refuges, too. The only downside to those is that the few times I’ve visited, they’ve been so full of people — many of whom were quite noisy and chatty — it was a better people-watching than bird-watching experience! I haven’t done Journey North, but I should. I have participated in the Great Backyard Bird Count, too. I just love the Red-bellied Woodpeckers. Such beauties! I swoon at all your birds, they look so exotic to me. I had to stop feeding the birds last year because of the neighbour’s 2 cats doing a regular patrol. Now they have gone I can enjoy watching them again. I swoon too, Chloris! I’ve enjoyed learning about the birds in this area–both residents and migrants–and there are quite a variety, though more at certain times of the year than at others. I’m glad those pesky cats are gone and your birds are safe from them. 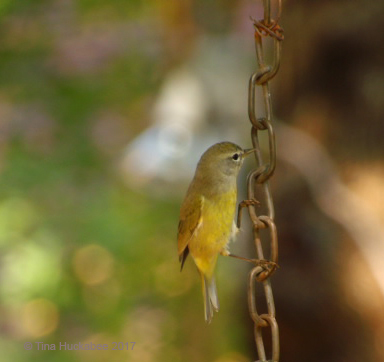 Congratulations Tina for participating in the Feederwatch Project! She is already a scientist, not an admirer of birds! Your handsome boy Blue Jay is really handsome. The red-bellied Woodpecker is beautiful. The orange-crowned warbler is very beautiful. I have a lot of birds in the garden of the country house. They all come together to chirp and form a hubbub that I love. It’s hard to see them and I do not understand any bird breeds. I would have to start by taking pictures of them when I see them well: I have tried and since I am inexperienced with the camera, I shot half an hour zooming in until I decided to put it in automatic mode and that noise frightens them or moves them and the photos they come out blurred. I’ll have to practice more with the camera. Many birds come to your garden Tina that are very well cared for there. Have a very good week. Greetings from Margarita. Ah, gracias, Margarita! I’ll bet your country birds are very interesting. The way I’ve begun to learn about (especially) the migrating birds, is to take photos, then research on the various bird sites (Cornell is my usual go-to, but also, there’s the Audabon Society) and compare markings, colors, etc. I never realized just how many migratory birds visit until I started with that process. Ah, thanks, Troy! The birds are certainly enjoyable to watch and I’m pleased they have a respite in my garden.